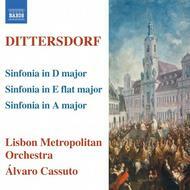 On this world première recording Baron von Dittersdorf’s attractive personality and inventiveness as a composer shines through in every movement of the three charming symphonies. These enchanting Sinfonias are performed by the Lisbon Metropolitan Orchestra, under the baton of Portugal’s leading conductor, Alvaro Cassuto. Composed in the 1780s around the time of his famous ‘Ovid’ Symphonies, the three symphonies included here abound in brilliant orchestral writing and quirky, infectious melodies.